I work full time during the week, and take my lunch every day. To save time, I prepare my food for the week on Sunday and divvy it up into glass containers so it’s easy to pack each morning. Also, I cook enough to cover dinner too as I never have time to cook during the week. The lasagna came out amazing. 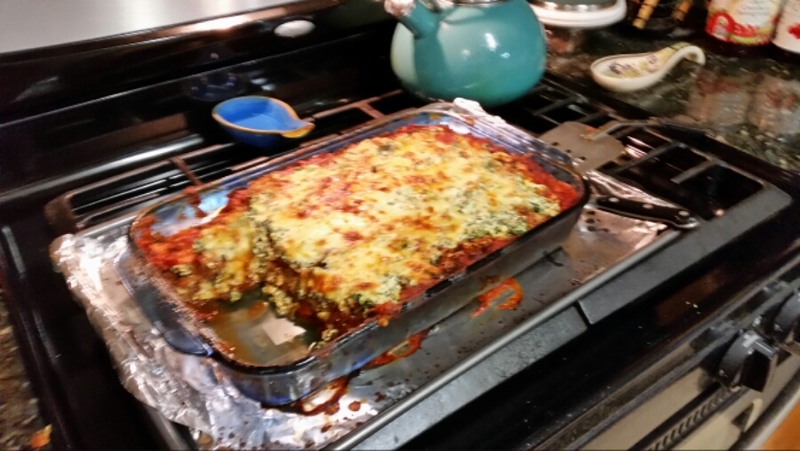 Technically, it probably shouldn’t be called lasagna because there is no pasta – eggplant slices replace the noodles. But is any case it is delicious. I had eggplants from Pinckney’s Farm CSA that I needed to use, so I cobbled together two recipes from Allrecipes.com. Preheat oven to 375 degrees F (190 degrees C). Oil two baking sheets with 1 teaspoon olive oil. Whisk eggs and water together in a shallow dish. Combine Parmesan cheese, bread crumbs, salt, and ground black pepper in a separate shallow dish. Dip eggplant slices in egg mixture. Press slices into the crumbs and tap off excess. Arrange slices on the prepared baking sheets. Remove eggplant from the oven and increase temperature to 375 degrees F.
In a Dutch oven, cook sausage, onion, and garlic over medium heat until well browned. Stir in tomato sauce. Season to taste. Simmer until heated through. In a mixing bowl, combine ricotta cheese with egg and 1/2 teaspoon salt. Squeeze/drain the liquid out of the thawed spinach & stir into ricotta mixture. In this order: meat sauce, eggplant, ricotta, mozzarella, make two sets of layers in a 9×13 pan. Cover with foil: to prevent sticking, either spray foil with cooking spray, or make sure the foil does not touch the cheese. Bake covered at 375ºF for 25 minutes, remove foil, and bake an additional 25 minutes.